It’s no secret I’m a big fan of Universal Audio and their products – I have my Apollo Quad and a selection of my favourite UAD go-to plugins. Coming from a lifetime of mainly indie recording and freelance work, I’ve managed to avoid working more than occasionally in expensive studios with swags of outboard equipment. So I’ve always had expensive tastes but only depressingly-low indie budgets, making the availability of rare and expensive vintage equipment well out of my price range. But the alternative – virtually-modeled vintage hardware – has always lacked some part of the magic of those original analogue versions. Until lately. Now increased computer processing power and more detailed and accurate non-linear modelling processes have allowed more of that magic to be emulated in software, and also processed in real-time. Waves, Slate Digital and others have done wonders with the quality of the software models. Universal Audio started off way back in the day making analogue gear, and then relatively recently moved into the digital world with their UAD side of things. Despite the move into digital, their ethos has remained based on professional-audio quality. And by hosting those resource-hungry plugins on some external processor chips, it also allowed for higher-quality modeling and/or more plugins to be used. When I first heard the UAD plugins, I was sold. It was the first time I had heard plugins approach the original sound I was used to. In my case it was the Studer A800 plugin, which felt remarkably close to what I’d been using for years. Was it exactly the same? I didn’t have the opportunity to A/B between them, but it “felt” and sounded the same as I remembered. It did the same things to the recorded tracks that I used the original for – the same colouration and compression I wanted for certain instruments. Except I could also turn off the tape hiss if I wished, and eliminate the wow and flutter. So the models not only recreate an original unit pretty closely, “warts and all”, but also allow you to disable some of the inevitable (and at the time really annoying) down-sides of vintage analogue technology. Or they might include some extra features that enable some easier practical uses, like having a mix control. By the way, they also allow a budding engineer/producer to get a feel for the vintage interface before they ever run into a real one in the studio. 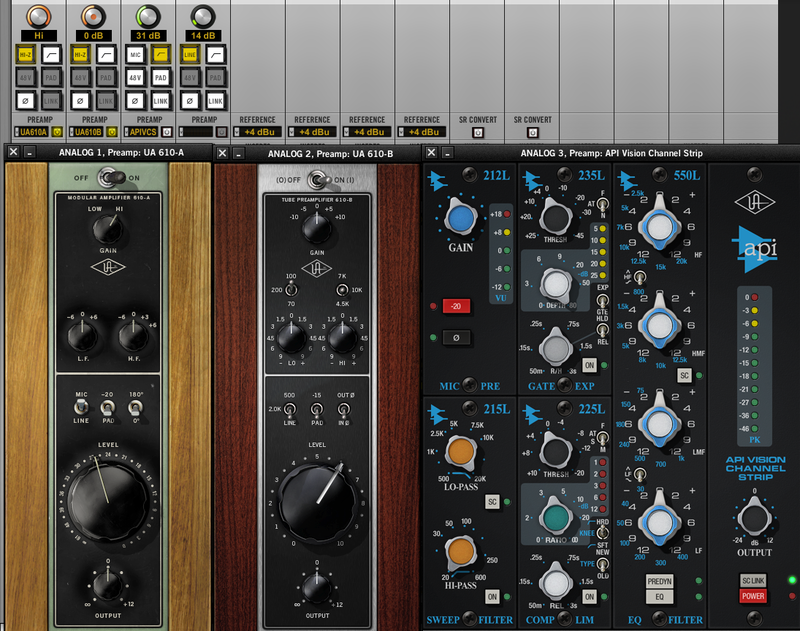 So – I have been relatively spoiled by my UAD plugin collection. When I had to upgrade my cheapo portable (OSX Mountain-Lion unsupported) Presonus Firestudio a few years back, I sprung for a UAD Apollo Quad. It’s been great. I bought the Thunderbolt option and never looked back. So it was quite a pleasant surprise to have this v7.5 update not only add a few extra plugins to the collection, but also to add extra functionality to my Apollo hardware. It’s a bit of an “Easter-Egg” really – apparently the functionality has always been there. The new preamp plugins directly access the preamp chips on the Apollo board and can adjust not only the gain, but also the impedance. This means that you get that much closer to the authentic sound of the real preamps. You get a choice of three preamps – the UA610-A, UA610-B, and the API Vision channel strip. These slot into a new “Preamp” slot in the Apollo Virtual Console. The beauty of this is that you can then record through them as if it is real hardware. How do they sound? Well – remarkably good. I tried various mics (Ribbon/Condenser/Dynamic) through each preamp type (even my gritty little Shure Green Bullet), and the difference in character and smoothness of each preamp was quite noticeable. The quite neutral preamps built into the Apollo itself allow the plugin character to feel pretty genuine, and the impedance selection just nails it. The harmonic overtones when driving them hard felt completely analogue. I did have some initial issues figuring out how to match gains when switching between the built-in Apollo preamps and the plugins (they have their own gain and level controls) for comparison, but once I sorted that out, there’s no way I’d ever go back to NOT using one of the new preamps. They all added some level of subtle musical character to the microphone, and the hardest bit was choosing which one was the most suitable for each mic or thing I was recording. My favourite is the 610-A at the moment, but that’ll probably change for my next recording.